Co-founder Peter Nixey just wrote up a riveting account of the recent launch of his startup clickpass for Vitamin. It’s a must-read. Plaxo was one of clickpass’s launch partners, so the story features a few cameos from yours truly. Another memorable moment came a few moments later when Ryan King, our VP of Engineering, called John (who had just woken up to the sound of me talking frantically with Immad; probably something like “well you’ll just have to work around it and set a config flag on your side!”) to ask him about breakfast. I suddenly realized that I’d only recently learned that clickpass was planning to launch this morning, and I’d never informed the rest of the Plaxo team that I was about to push this new code live. (Our release process is normally more disciplined, but luckily our team is very supportive of my frequent need to push code out-of-band to meet external press deadlines). So I motioned to John to give me the phone quickly, and told Ryan (somewhat meekly), “uh, oh yeah, just so you know, I’m about to patch a bunch of code so we can help this startup called clickpass launch. I’m pretty sure it’s not going to break anything, but I thought I should give you a heads up. Hope that’s ok.” Not my most professional moment, but it’s not the first time this has happened either, and I’ve never done *that* much damage before, so I think Ryan said something like “ok, just keep an eye on it please”. Hmm, does checking twitter obsessively count? Actually, in this crowd, that’s about as timely and accurate as checking our servers’ log files. 🙂 And of course, in the end, everything worked out fine. For any startup that wants to partner with established players–or for that matter, be successful in any event–these are vitally important qualities. It’s what finally got us in the position where I could feel good about integrating clickpass into Plaxo in time for the launch–we worked back and forth until we found a way to get a good user experience without having to significantly change our existing UI or backend. 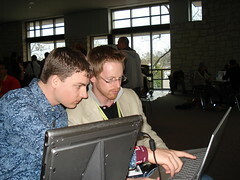 This included huddling around a table on the floor of the SXSW convention center with Peter, talking about flows and edge cases (pictured above), and many a skype session with Immad tracking down bugs and deployment issues. But it was all worth it–the launch was a huge success, and the partnership provided clear benefits to both parties, and more importantly, to our users. Mr. Smarr, tear down this wall! Testing comments from inside Pulse.